A few years ago, Brian hinted that he was working on a new project with me in mind. Since then, he has revealed little parts of it and it has built up a lot of anticipation. I have been excited for this opera for a long time now and I'm so glad that it has come together in a way I never imagined. That is a great question! The opera itself is a remarkable idea that has come to life. It has been amazing to see it come to fruition over the past couple of years. I feel very grateful to be part of any creative process where I've been involved from the beginning and can bear witness to the evolution of the project. For example, I remember a previous workshop where I sang a different role to my current roles, which Brian tailored to my vocal range. It's wonderful to work so closely with a composer. There is nothing like the sound of young people making music in The Barn, running around the meadow with their friends, having ice cream at the Concession stand, dashing over to the pond to check out the frogs, and seeing the joy on their parents’ faces as they make music. It has always been an important part of Westben that The Barn be a place where community meets and performers get a chance to explore their creative ideas and this opening weekend will overflow with exploration and joy. On Friday, June 3 at 7 pm at The Barn, singer song writer Ken Tizzard, along with Ken Grant on bass, will present a tribute concert to the great Ron Hynes, called Ron Hynes in Hynesight. Ken toured with Ron and has many stories to tell about his fellow Newfoundlander, the Man of A Thousand Songs. Ken’s own albums including his latest, No Dark No Light, tell real stories with such honesty and depth. We are very lucky to have Ken living and performing in our community. On Saturday, June 4 at 7 pm jazz will abound in The Barn (and three fields over) with CDHS Music Night. The award winning junior and senior jazz ensembles will play with the vocal jazz ensemble. Dave Noble continues to inspire these young musicians to perform at such a high level and still keep the joy of music making. It is truly remarkable what he has done for music in this community. If you are counting, we are up to 52 performers but on Sunday, June 5 at 3 pm, the remaining 78 will burst onto the stage with the concert called “Let it Go!” This is a celebration concert of song and concert band music from marches to Disney’s Musical Frozen featuring the Westben Wind Ensemble and Instrumental Foundations bands, the Westben Youth, Teen, B Natural Choruses and the debut of the newly formed Westben Cookie Choir. There are 17 cookies ages 4 to 8 and they are ready to sing Baby Beluga. The Westben Youth cannot wait to share Under the Sea from Disney’s The Little Mermaid and the Teens soar in Seasons of Love from the musical Rent. The B Naturals have Bohemian Rhapsody ready to go and the Wind Ensembles have Mission Impossible and Ancient Voices all set! Whether it is Hindsight or Hynesight or Foresight or future professional musicians, the important thing is that these musicians are here now in our community. They are making beautiful and exciting music now, not in the past, not in the future, but now. Let’s celebrate their gifts of storytelling and music making now while we have the chance. Support them because you want to go on the journey with them. Let their music in and change you. I guarantee you will leave feeling more energized. The Barn is open and relaxed and experiencing a performance in nature is a great way to celebrate the joy of music and community. Visit www.westben.ca for details or join in the conversation on Facebook. Connecting is as simple as letting go. Every week at rehearsal I am in wonder of the young voices of the Westben Youth and Teen Choruses. It's not that the voices are loud or soft or weak or powerful, but it's the joy of discovery in their eyes, their giggles, their squiggles, their energy of life, that takes me to a new place every time. This place is worth pursuing! Music has such transformational power if you let it in and my hope is that Westben is an entrance way for those of all ages to experience it. I am thrilled to welcome Andrew Queen, Karen Stille and the the Campfire Crew to the Clock Tower where they will be presenting new youth programming called Tune Tales . There will be two sessions November 27 starting at 10 and 1 pm. Check out their video and call Nancy at the Clock Tower 705-653-5508 or toll free 1-877-883-5777 if you would to bring a special someone ages 4 to 8. Mondays and Wednesdays at the Clock Tower are brimming with merry songs as the Westben Festival, Youth, Teen and B Natural choruses prepare for the November 28 and 29 performances at The Barn. These Christmas-time concerts at Westben have become a tradition for many families to get into the seasonal mood but if you have never been, then let me give you a snapshot. After you park your car at Westben, perhaps a light dusting of snow on the ground will set the mood as you make your way down the path, past the red lanterns, to the cozy Barn. Dress warmly with a coat, boots, hat and mittens and bring a blanket as The Barn is not heated. There will be Santa hats everywhere as the volunteers welcome you inside to the glowing Barn decorated with boughs of cedar and ribbon. A free cup of hot cider and homemade cookies will warm you up as you make your way to your reserved seat in one of the movie theatre-style cushion seats. The applause to welcome the 75 performers on stage is often comically muted because everyone has their hands covered. I love the cross generational nature of these concerts with performers ranging in ages from 7 to 80. Stratford actors Chick Reid and Frank Moore will be narrating short stories in between the songs performed by the four choirs (and I have a couple of solos). The music is of course is seasonal including I Saw Three Ships, O Holy Night, Ave Maria, Here We Come Wassailing, Magnificat by John Rutter and several others. The performance is 90 minutes with no intermission, which means on Saturday, November 28, you will have time to go to the concert at 1 pm and still be able to see the Santa Claus parade in Campbellford starting at 3:00 pm. Sunday, November 29 the performance at The Barn starts at 3 pm. Saturday, December 5 Songs of Merry travels to Norwood United Church and on Sunday to Belleville at Bridge Street United Church, both starting at 3 pm. Tickets may be reserved by calling Westben at 705-653-5508 or www.westben.ca. But first join us Saturday, November 7 at 7 pm at the Clock Tower for a House Concert! Christian Hodge, now 17 will be performing with friends in the band called Northern Sound. Northern Sound is an indie band that fuses folk, pop, and rock to introduce a truly happy sound. Hailing from Northumberland County, this young quartet draws influences from the current pop scene as well as early folk music. Acoustic instruments blend with electric, and meld together with a wide array of percussion to create a unique experience. This is a pay-what-you-can event so join us this Saturday at the Clock, 36 Front Street South in Campbellford at 7 pm. If you arrive early at 9 am you can join in the Westben Wind Ensemble and yes we have instruments for you! For more information on the instrumental programs, the House Concert or Songs of Merry, call me at the Westben Box Office 705-653-5508. Westben has been presenting Jazz since 2001 but this year, celebrating new traditions, Westben is launching a new Jazz Fringe Festival. Let’s celebrate Jazz before and after The Barn performances in the eateries and retail stores in Trent Hills and at the Clock Tower on the August long weekend! Thanks to Arif from MacLaren IDA Pharmacy for encouraging us to get this idea off the ground. Your friendly smile and great service Arif lead the way! The weekend starts Thursday evening with Brian’s Pick, the electronic, gypsy jazz meets les Quebecois group MAZ at 7 pm at The Barn. Friday at 7 pm TGIFiddle! Welcomes Kelli Trottier & The Mushy Peas back to The Barn. The pre-concert barbecue must be ordered today (July 28) by 2 pm. Kelli is amazing but so are The Mushy Peas. If you have noticed an increase in quality of the sound this year at Westben it is due to the talented Andy Thompson who plays keyboards in The Mushy Peas. Andy is a genius at sound and has an amazing recording Studio called Studio 29 near Warkworth. Brian and I made our Lullabies for Benjamin and Christmas of Love and Light CD in Andy’s studio. Saturday at The Barn features the award winning Jane Bunnett and her group Maqueque at 2 pm. I can’t wait to dance to their beat. Rising star (not bias at all) Chelsey Bennett will open for Jane Bunnett. And now to the Jazz Fringe Festival. After the 2 pm concert at The Barn, you have your choice of restaurants in Campbellford (Capers, Apollos), Hastings (Banjo’s Grill) and Warkworth (Garden of Eatin’) to enjoy Jazz Desserts from 5 pm to 8 pm. But it doesn’t end there because at 8 pm, pull out your saxophone in the car and join Chelsey Bennett, Rob Phillips, Howard Baer and Harry Ellis at the Clock Tower in Campbellford for a Jazz Jam (8 pm to 10 pm). No cover charge, just a free will donation and wine will be available to purchase. The Campbellford Waterfront Festival will be on all day on both sides of the Trent River by the bridge with lots of new activities including a wine tent by the Clock Tower. At 10 pm will be fireworks over the Trent River by the Clock Tower. Sunday morning from 10 am to 1 pm is Jazz, the Morning After, brunch with area jazz musicians at Be My Guest and Capers in Campbellford and Our Lucky Stars in Warkworth. At 2 pm at The Barn is the final concert of the summer season, Sunny Day and Sinatra featuring Dean Hollin, myself and the Brian Barlow Big Band. Brian Barlow is the Prince Edward County Jazz Festival AD so be sure to visit http://www.pecjazz.org for details. So, with great anticipation bring on this week! One foot in front in of the other! This is the point in the Westben Season where we find ourselves saying “one foot in front of the other”. The “we” refers to not on the Westben Box Office staff but the volunteer catering team, volunteer front of house team, production team and billets. After months and months of planning, organizing, and marketing for Season 2015 we are passed the mid-point with only three weeks left in the summer season. Every day I remind myself how wonderful it is to be surrounded by these musicians and actors, watching them rehearse, prepare and perform. I find their energy inspiring and the stories of their travels very interesting. A common theme again this year is that the artists say they enjoy coming to Westben, not only because they love performing in The Barn, but because they find the area so beautiful and the people friendly and welcoming. Well done everyone! If you have seen the Westben brochure (and please tell me you have), the beautiful woman on the cover, Marie Josée Lord, will be performing this Saturday, July 18, 2 pm at The Barn. As the Montreal Gazette says, Marie Josée Lord is “spellbinding.” She sings with such freedom and passion that she is totally engaging. You likely won’t notice the beautiful meadow and birds and openness of The Barn this time as you will be so enthralled with her performance. The program, says Westben’s Artistic Director, Brian Finley who will be accompanying Marie, “is a variety of opera, art songs and spirituals ranging from Puccini’s La boheme to Gershwin’s Porgy and Bess and Cole Porter’s Just One of Those Things.” On Sunday, July 19 at 2 pm one of Canada’s finest concert pianists, Stewart Goodyear will perform Bach’s Goldberg Variations. Join Barb Hobart for a pre performance chat at 1 pm. Stewart was born in Toronto but is now based in New York has performed with the major orchestras of the world including the New York Philharmonic, the Los Angeles Philharmonic, the Royal Liverpool Philharmonic, the Toronto Symphony, the Philadelphia Orchestra and many others. On Thursday, July 16 at 7 pm is a “Brian’s Pick” concert called Romancing the Harp with Valerie Milot, harp and Antoine Bareil, violin. TGIFun! returns with Mary Lou Fallis and Peter Tiefenbach in Primadonna and Friend Strike Back. Mary Lou Fallis is “…the fabulousest, Canadianest diva of them all… with wit as dry as a vodka martini…” says the Toronto Star. Kings on Broadway concerts begin Wednesday July 22 and continue to Saturday, July 25 with selections from Camelot and The King and I. TGIFilm! On Friday evening, 7 pm at The Barn will feature the 1946 black and white film, Anna and the King of Siam and on Sunday July 26 features the a capella choir of Le studio de music ancienne de Montreal in Music from the Sistine Chapel. The summer season ends with Jazz at The Barn and the new Jazz Fringe Festival across Trent Hills, but more on that later. See you at The Barn! Westben is celebrating New Traditions this season and one of the new ventures is the creation of packages that celebrate local experts from our community. In April we met Luke Mercier from Springbrook who will be holding a workshop on Fiddler making and restoration as part of Westben’s Fiddling Around with Luke Package June 13 (including a performance of Fiddler on the Roof at The Barn). Another absolutely incredible talent, who lives near Warkworth, is photographer Gary Mulcahey. His work is truly amazing and Westben is offering a chance for all photographers to bring their cameras July 3rd and 4th and work directly with Gary “shooting artists.” Picture this! A wonderful opportunity for photography enthusiasts to explore musical portraiture! Known for his portraits including artists of the Canadian Opera Company, Warkworth photographer Gary Mulcahey leads one of the most exciting weekends in photographic memory! On Friday, July 3, meet Gary with other Westben artists at the Clock Tower for an informal chat over wine and goodies. After a restful night at one of the area’s B&B’s or motel’s, Bring your camera on Saturday morning at 10:00 am as Gary shows you how to explore all the angles of shooting artists from UBC Opera Ensemble before their afternoon performance at The Barn. After a short 5-minute drive to Westben to enjoy your delicious Windswept picnic lunch, find your seat for the Ensemble’s fully-staged production of Verdi’s unforgettable opera, La traviata at 2:00 pm. Afterward, browse the shops in Campbellford and Warkworth or do some fishing in Hastings. Dinner is at Capers Restaurant before a peaceful night at one of the area’s local B&B’s or motels visit www.westben.ca/packages for details. Gary's passion for photography started at 11 years of age when his father lent him his first camera – a Yashica twin lens reflex and set him up with a black and white darkroom. While the other children took their first jobs delivering newspapers, Gary was at the local baseball diamonds and rinks taking and selling team photos. At age 22 Gary attended the Photography Program at Fanshawe College in London Ontario. By age 25 he was working as a full time freelance photographer producing images for magazines, advertising, the performing arts, and private and corporate clients. He has lived and worked in Toronto, Dublin and Madrid. Gary's work has been published in television and print media including a variety of magazines such as National Post: Business, MD Canada, Canadian Diamonds, Up Here, and Watershed. Recent books include Private Gardens of Northumberland Hills, an exclusive showing of Gary's garden photography, and Comayagua, a collection of portraits and landscapes from impoverished rural mountain communities in Honduras. Recent Exhibits of Gary’s include Comayagua. portraits from the mountains of Honduras at the Gerrard Art Space in Toronto and Picture Change, an exhibition produced by PhotoSensitive containing one photo by each of over 100 top Canadian photographers. This collection of the most meaningful photos in each photographer’s portfolio highlights the way that photography can make a positive change in the world. Visit this amazing web site www.photosensitive.com. Most recently Gary has started publishing the quarterly art magazine NuWork. www.nuwork.ca. Gary was born and raised in Sault Ste Marie, Ontario. He now makes his home in the Hills of Northumberland County Ontario where he operates Mulcahey Image Company www.mulcahey.com. In his spare time Gary road races motorcycles and manages his small organic vegetable garden. Westben has used several of Gary’s photographs for the covers of the brochures and they are not simply pictures but works of art that inspire that challenge and lift the human spirit. She had incredible energy in the mornings and it often amazed me as I was eating my breakfast how quickly I was thrust into the new day with her stories. She was involved in many community organizations as a volunteer and it was her profession, along with being a Mom of 5 kids. She loved to sing and when I was young (before her fateful vocal cord operation) she sang in choirs and with my Dad at the piano, as a soloist all over the area. She could sight read at the piano incredibly well and was always inspiring us at family gatherings to pick up our instruments (violin, cello, saxaphone, flute, clarinet and guitar) and play together. Unfortunately, she was taken before Westben was created but she was with us during the sprouting of its seedlings. She welcomed us home from our musical studies and performing career in Europe and the birth of our first child and my first performances with the Canadian Opera Company. Her zest for life and bringing people together through music continues to be a big inspiration for Westben. Westben continues to be a place where friends gather and people meet and become friends. Not only volunteers, chorus and band members, but Members who book their same seats every year and get to know their neighbours in music. Nature continues to be a huge part of the Westben Experience, nurturing the joy of the music and bringing us to the core of art, a better place. So next time you see a butterfly whisk through The Barn during a performance, say hi to my Mom as her inspiration is soaring by. Any guesses on what the musical is called? When eight-year-old daughter, Virginia O'Hanlon asked her father in 1897 whether Santa Claus really existed, he suggested she write the editor of the New York City prominent newspaper, called The Sun. He said "If you see it in The Sun, it's so." Editor Francis Pharcellus Church's response was so thoughtful and inspiring that more than a century later this is the most reprinted editorial in an English Language newspaper. "Dear Editor—I am 8 years old. Some of my little friends say there is no Santa Claus. Papa says, "If you see it in The Sun, it's so." Please tell me the truth, is there a Santa Claus?" "Virginia, your little friends are wrong. They have been affected by the skepticism of a skeptical age. They do not believe except they see. They think that nothing can be which is not comprehensible by their little minds. All minds, Virginia, whether they be men's or children's, are little. In this great universe of ours, man is a mere insect, an ant, in his intellect as compared with the boundless world about him, as measured by the intelligence capable of grasping the whole of truth and knowledge. Not believe in Santa Claus! You might as well not believe in fairies. You might get your papa to hire men to watch in all the chimneys on Christmas Eve to catch Santa Claus, but even if you did not see Santa Claus coming down, what would that prove? Nobody sees Santa Claus, but that is no sign that there is no Santa Claus. The most real things in the world are those that neither children nor men can see. Did you ever see fairies dancing on the lawn? Of course not, but that's no proof that they are not there. Nobody can conceive or imagine all the wonders there are unseen and unseeable in the world. You tear apart the baby's rattle and see what makes the noise inside, but there is a veil covering the unseen world which not the strongest man, nor even the united strength of all the strongest men that ever lived could tear apart. Only faith, poetry, love, romance, can push aside that curtain and view and picture the supernal beauty and glory beyond. Is it all real? Ah, Virginia, in all this world there is nothing else real and abiding. Brian Finley and Westben Teen Chorus Graduate Mackenzie Cameron have crafted a script which highlights Virginia's letter and the editorial and other Christmas letters. Actor and radio personality Linda Kash, (fondly known as the cream cheese angel) and who now lives in Peterborough, will be the narrator for the concert and I am sure will bring these letters to life. Drawing upon Linda's specialty of improvisation, there may be a few "improv" moments as well. The Westben Festival, B Natural, Teen and Youth Choruses will be performing seasonal music intertwining the letters. 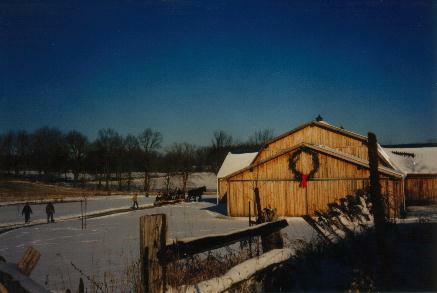 The wind tells me there may even be another special guest so listen to "up on the roof top..." The Barn performances (November 29 at 1 pm and November 30 at 3 pm) have become a tradition for many families to get into the mood of the season. Remember to dress warmly and bring a blanket, as The Barn is not heated. Westben volunteers will warm you up though with smiles and a cup of hot apple cider and homemade cookies. Other performances are in Norwood (December 6 at 3 pm) and Peterborough St Andrew's United (December 7 at 3 pm). But first join us at The Clock Tower Saturday, November 22, 7 pm for a Pre CD House Concert with myself, Brian and Ken Tizzard with performances and conversation about our upcoming CD's." Hope to see you at Westben's "Yes, Virginia!" concert and in the word of editor Francis Pharcellus Church " continue to make glad the heart of childhood."